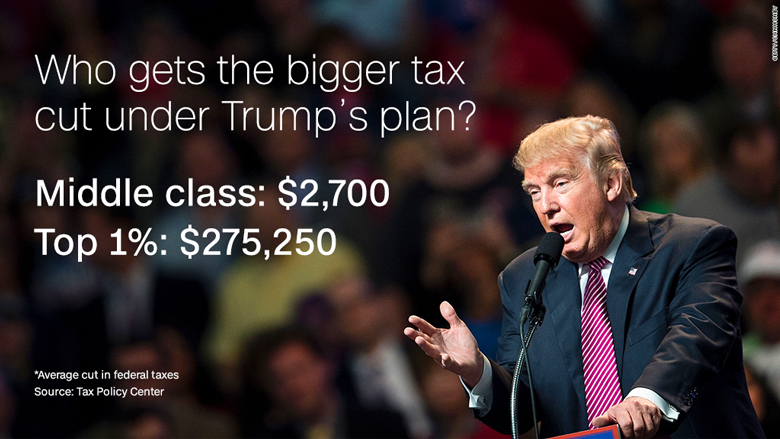 Donald Trump may say he's concerned about the little guy, but his tax plan would give the wealthy far bigger breaks than the middle class or working Americans. 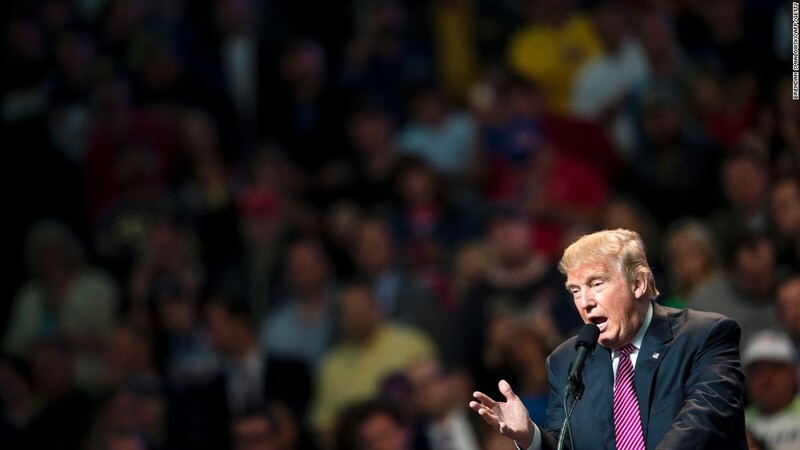 The presumptive Republican nominee stirred up a firestorm Sunday when he said that taxes on the wealthy would likely go up during negotiations of his plan with Congress. He later clarified that he was open to raising the top rate he proposed for the rich, but they would still pay less than they do now. Trump has left himself a lot of room to negotiate since his plan calls for big cuts in the top tax rates. The billionaire businessman boasts that he would slash everyone's taxes, but his proposal is far more generous to the upper crust than to the average Joe. The proposal calls for reducing the current seven tax brackets to four and cutting the top rate on the wealthy to 25%, from 39.6%. It would also eliminate the estate tax, which affects only the very wealthy with more than $5.45 million in assets at death, and the Alternative Minimum Tax, which ensnared many affluent families. Certainly, Trump is proposing to get rid of some deductions and loopholes for the wealthy. He also wants to eliminate the carried interest loophole, which greatly lowers hedge fund managers' tax liability, though his lower tax brackets take most of the sting out of that change. Trump's plan calls for hedge fund managers' profits to be taxed at ordinary income rates, instead of capital gains. But since he'd lower the top rate to 25%, from the current 39.6%, the managers wouldn't end up paying much more than the current maximum capital gain rate of 23.8%. What's more, Trump also proposed to lower the business tax rate to just 15%. Since hedge funds can be organized as business partnerships, they could restructure much of the money paid to managers so that they'd only have to pay 15%, much less than they do today. Middle-income Americans would see a federal tax cut of $2,700, or 4.9% of their after-tax income, on average, according to a Tax Policy Center analysis. The Top 1% would see a whopping $275,250 reduction in their federal tax bill, or 17.5% of their after-tax income. But Trump's tax proposal doesn't match his rhetoric on TV or the campaign trail. Trump, who has a large following among blue collar workers, has repeatedly said that the rich won't be happy with him and that his plan will even cost him a fortune. "We're reducing taxes, but believe me, there will be people in the very upper echelon that won't be thrilled with this," he said when he released his plan in September. And this weekend, he made contradictory statements and seemed willing to throw the rich under the bus in order to protect the middle class and businesses. On one hand, he pledged to try to get his plan through Congress as is. "We're going to submit the optimum. That's what I'd like to get and we'll fight for it," he said on ABC's This Week. But he also acknowledged that he will likely have to bargain with lawmakers to get it approved. That's when his loyalty to the rich appears to waiver. "When it comes time to negotiate, I feel less concerned with the rich than I do with the middle class ...The rich [are] probably going to end up paying more," he said on NBC's Meet the Press, later clarifying he meant more than what's in his plan, not than what they pay now. "The thing I'm going to do is make sure the middle class gets good tax breaks. Because they have been absolutely shunned. The other thing, I'm going to fight very hard for business." Ultimately, however, he has promised the wealthy that no matter what Congress tries to do, they will still pay less under President Trump.